Pushkar is a backpacker hub surrounding a small lake in Rajasthan, India. The lake is also a local pilgrimage site and many people flock there each year to bathe in the holy lake, meditate in the many temples and find some peace among the hustle and bustle of India. The lack of tourist attractions in Pushkar make it a great place to have some time out during your trip and the constant stream of backpackers mean it's well equipped with some Western comforts. Although the power still goes out several times a day! We were in Pushkar in April and the weather was really heating up. If you are there over the summer months I recommend making sure you have air conditioning. 2 days in Pushkar is enough to see everything in this little town but you could easily spend weeks relaxing here. 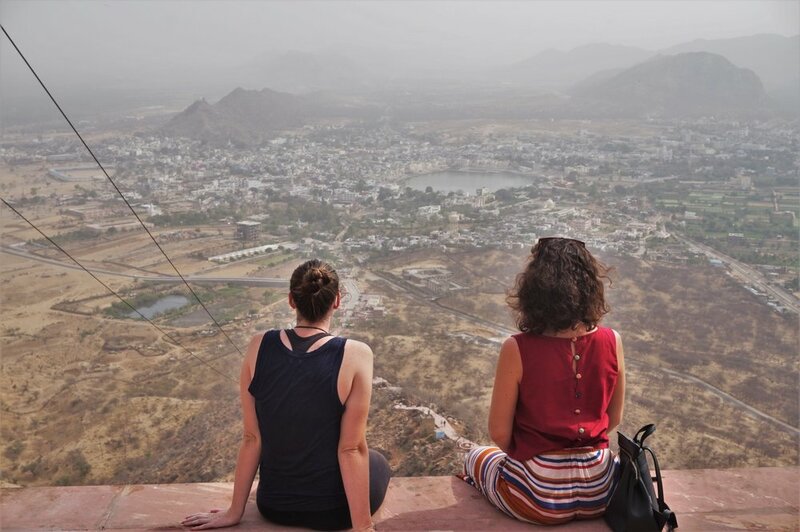 So if you're considering a stop here are some cool things to do in Pushkar, Rajasthan. For more places to see around Pushkar check out our full Rajasthan itinerary and planning guide. Pushkar is an ancient pilgrimage site and many people come to bathe in the holy water of the lake. The centre piece of Pushkar is a serene place to walk especially during the early evening. You need to take your shoes off but then you walk the edges of the entire lake watching locals bathe, gather and pray. Make sure you don’t take photos of people bathing. The main attractions of Pushkar are its many temples from all different religions. The Sikh temple is very impressive on the outside and free to visit. There is also a range of Hindu temples all around the lake and town. All of them are in short walking distance so grab google maps and go wandering. If meditation is your thing pay a visit to the Meditation Temple next to the lake. There is a popular area, aptly named ‘Sunset Point’, where many people gather in the evening to watch the sunset over the lake. There is often music and travellers performing various acts such as hula hooping. There are often cows, dogs, beggars, local couples and tour groups to add to the mix. Grab a drink at sunset Point Café and watch the action. Atop a hill overlooking Pushkar is Savitri Temple. To get there you can walk to the edge of the town and up hundreds of very steep stairs. The walk is pretty unpleasant in the heat so as an alternative there is a cable car taking visitors to the top. It often looks out of order but moves whenever there are passengers. We paid 70 INR per person one way, the ‘ticket’ was a small handwritten note so I wouldn’t take that as an official price! This sounds odd but if you’ve spent any time travelling in India you’ll know that a good salad is hard to come by. Thankfully the flocks of backpackers in Pushkar mean that the food is tailored to Western tastes. There are some excellent vegan/vegetarian options, freshly baked bread, falafel and you can definitely find yourself a fresh salad. Don’t worry, there is still plenty of Indian food available for those still hooked on masala spices. We loved the food at Honey and Spice, Nature’s Blessing and Laura’s Café. There are plenty of schools, orphanages and animal welfare centres in the area around Pushkar. If you are interested in spending a little longer and helping out have a look online or ask around once you get to Pushkar. The Laughing Buddah Café supports a school which may take volunteers and Nature’s Blessings Café organises tours to an animal shelter. If you want to see the desert then head out on a camel or in a jeep to see the vast open spaces of the sands surrounding Pushkar. Tours are arranged almost everywhere in the city so ask around for some prices. We don’t ride animals but if you choose to make sure the camels are treated ethically. 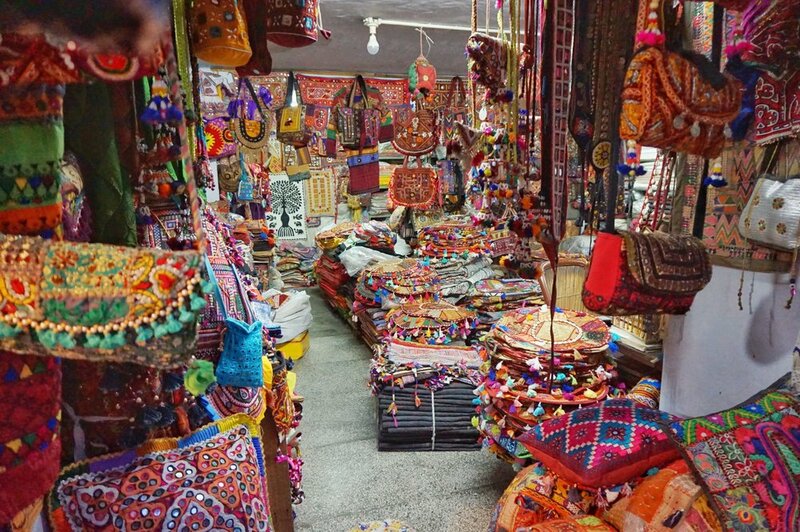 We found Pushkar to be a very relaxed place to shop by Indian standards. Many shop keepers won’t bother you while you look and some items even had set prices. There was a good range of clothing, books, jewellery and gifts for reasonable prices. We still needed to negotiate a lot of prices but we found the ones offered outright weren’t as ridiculous as other tourist towns. So don't put too many things on your India packing list to leave some space in your backpack. The Pushkar Camel Fair takes place every November and is a real spectacle. Tens of thousands of camels arrive in Pushkar to be traded but also just to be shown of to the thousands of people who flock to see the sight. All kinds of parades, camel beauty contests and general camel related fun happen over the week of the festival. Expect accommodation prices to go up during this event. 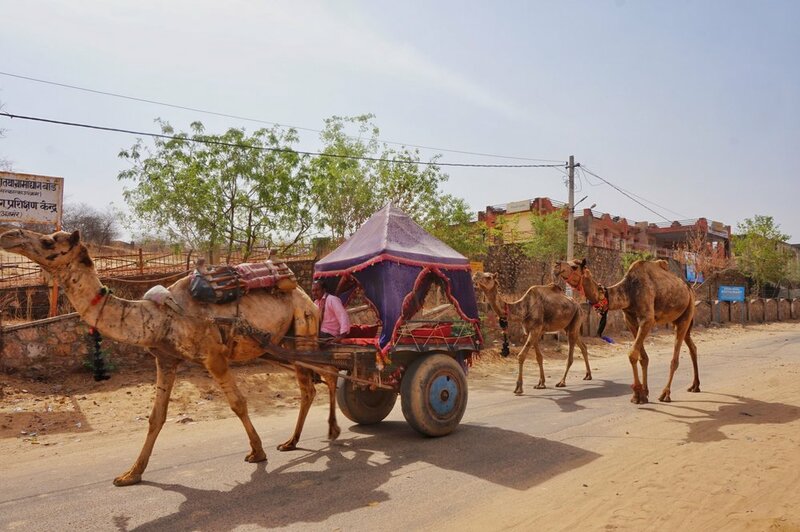 Pushkar is connected to the rest of Rajasthan through the bigger town of Ajmer which has a large railway and bus station. From Ajmer you can take a local bus to Pushkar which takes about half an hour and costs 16 INR. Alternatively you can pay a taxi which will cost about 500 INR.